Henson is absolutely killing it on EMPIRE, but while I was watching this week’s hour, it kept hitting me how great it was to see her as Joss Carter again. The show also managed to bring some of the best Carter/Reese scenes of the series in “Terra Incognita”; Henson and Jim Caviezel are just great together. Are you excited to see Carter back on POI? 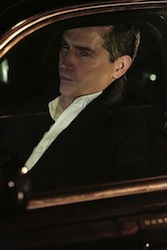 PERSON OF INTEREST airs Tuesdays at 10 PM on CBS.